MTM is held just around the corner from the famed Marrakech Kasbah, a world class destination featuring a major 24x7x365 event with an eclectic and vibrant mix of people, food, and adventure shopping. Travel buyers and sellers swarmed the laser-lit "big tops" to meet, network, learn and share the latest information about travel and tourism offerings in North Africa and beyond. Mr. Lamrani Mahdi, manager of PR and communications for the event, described reasons for the overwhelming success of the MTM: "Morocco is really a growing tourism market and ranks 31st among the most visited countries in the world and 2nd among all African countries. Actually, we created MTM because there was a big need for a show like this in the region. We wanted to create something that attracted travel and tourism professionals, both suppliers and buyers, bringing them together to do business and advance their initiatives. The event includes not only leisure, luxury and business travel segments, but also a large sustainable tourism sector. As a result of all these factors, we are getting bigger and better every year. This year we are expecting 1300 attendees up significantly from the one thousand we had last year." MTM features 30,000 square meters of exhibition space and creates direct approach opportunities with 600 international buyers. Participant registrations for the 2010 event were up as follows: 12% increase in exhibitors, 70% increase in hosted buyers, and a 25% growth in participating countries. Sandy Dhuyvetter, executive producer and host of TravelTalkRADIO, described MTM as, "a unique variety of travel services and destinations and an incredible experience for us opening up our eyes to all the diverse offerings that Morocco and North Africa present. Exhibits, information, B2B networking, seminars, investments, infrastructure, MICE, education &endash; anything you need to know about travel and tourism in Morocco and MENA for that matter is all right here." 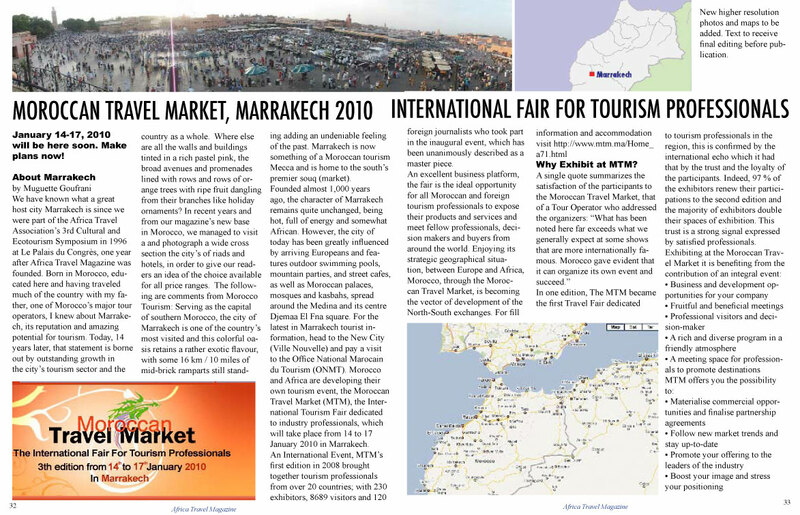 The 4th edition of the Moroccan Travel Market is scheduled to occur once again in Marrakech in January 2011. To listen to the complete interview with Mr. Lamrani Mahdi, please go to: http://www.TravelTalkMEDIA.com/archives_jan24_10.html#1010. 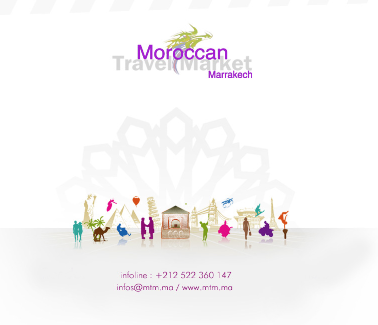 For more on the Moroccan Travel Market, go to: www.MTM.ma. Leading African countries in hits, pages read and visits to our site. Morocco and Africa are developing their own tourism event, the Moroccan Travel Market (MTM), the International Tourism Fair dedicated to industry professionals, which will take place from 14 to 17 January 2010 in Marrakech. An International Event, MTM's first edition in 2008 brought together tourism professionals from over 20 countries; with 230 exhibitors, 8689 visitors and 120 foreign journalists who took part in the inaugural event, which has been unanimously described as a master piece. A single quote summarizes the satisfaction of the participants to the Moroccan Travel Market, that of a Tour Operator who addressed the organizers: "What has been noted here far exceeds what we generally expect at some shows that are more internationally famous. 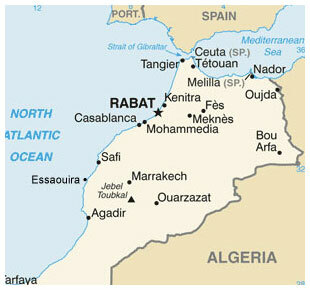 Morocco gave evident that it can organize its own event and succeed." In one edition, The MTM became the first Travel Fair dedicated to tourism professionals in the region, this is confirmed by the international echo which it had that by the trust and the loyalty of the participants. Indeed, 97 % of the exhibitors renew their participations to the second edition and the majority of exhibitors double their spaces of exhibition. This trust is a strong signal expressed by satisfied professionals.  Attend conferences, discussions and debates organized for professionals and assert your positions.